Spring has sprung in the Virgin Islands and the season has brought an abundance of special events for the islands and St. John Catering. We were honored to win the Best of VI for the tenth year in a row for Catering, Private Chefs, and Party Rentals. We are honored to receive the award, and are nothing but grateful to our clients, the Virgin Islands community, and our hardworking staff for this recognition. We’re also excited to be continuing the Full Moon Dinners in partnership with Lucky Chops Lounge in Cruz Bay. The April Full Moon Dinner headed by the Lucky Chops Sushi Chef Larry Parnell was a hit with an 8 course meal themed Japanese Extravaganza. 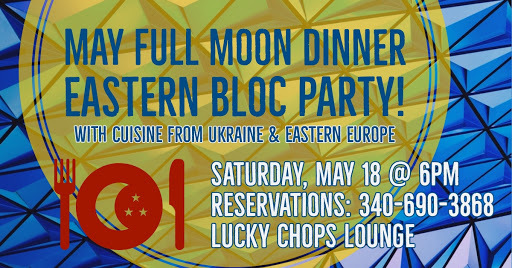 Eastern Bloc Party is the theme for the next Full Moon Dinner on Saturday, May 18th with a menu inspired by the cuisine of Ukraine and Eastern Europe, where Lead Chef Lori Dudkin spent years studying and living. In addition, we were honored to cater for the St. John Historical Society’s 45th Anniversary celebration held at Lucky Chops, and the 2019 Hit Makers & Rum Chasers St. John event that benefits the Charlie Foundation, which distributes funds to address the critical needs of children in the US and US Virgin Islands. We are now taking reservations for the rest of the 2019 season for wedding and large event catering as well as private chef and in-villa services because there’s too much happening on St. John to waste event a moment doing anything other than enjoying yourself! Whether designing your Caribbean destination wedding, rehearsal dinner, or gathering of any kind, St. John Catering works closely with you to ensure that your event is as flawless and stress-free as possible. From island casual to white linen formal, we can do it all., professionally, on a beach or at your villa. With over 20 years of experience and a sterling reputation in the Virgin Islands, we take pride in offering generous hospitality, world-class cuisine and personalized service to every client. After a day at the beach when you don't want to worry about making reservations, let alone cook a meal for the family, allow us to do it for you. Create your own a la carte menu from our list of selections and you can feed any group of 4 or larger a gourmet meal without the hassle of prepping, shopping, cooking and cleaning up. All items arrive ready to heat and eat. If you have a Grill Master in your group, we can include the premium proteins dressed and ready for you to cook just how you like it. When in paradise, refuse to waste a minute doing what you could at home and spend every second indulging in life in the Virgin Islands! For the most luxurious dining on island, invite our skilled chefs to prepare and serve you a meal in the comfort of your beautiful villa or home. Choose from a variety of services ranging from a simple cocktail hour with a selection of passed appetizers to an informal or home style family meal. Or truly pamper yourself with a private, quiet, multiple coursed meal. Full Moon Dinners Return for the 2019 season! Get all the details HERE for our next FULL MOON DINNER. 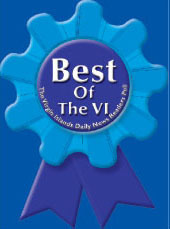 Voted Best of the VI for ten years running, 2010-2019!